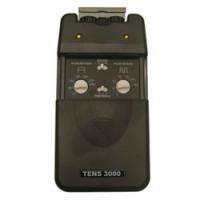 The TENS 3000 analog unit uses a microprocessor, which gives exact dial performance. Benefits includes maximum full strength power of 80 mA. The TENS 3000 is as accurate as a digital unit, yet easy to operate. The safety amplitude cap protects the amplitude knobs from accidental bumps or knob movements. TENS/EMS Units & Stimulators can be found in our extensive online collection of products from globally recognized and trusted brands, including Current Solutions. An excellent option to consider is the TENS 3000 Analog Unit.